What should the referee have done? The score is 14-all. New Zealand are attacking inside the French 22. A tackle/ruck becomes unplayable and a scrum is awarded to New Zealand about 10 metres from the French line, slightly on the right of the posts from New Zealand's perspective. Aaron Smith is to put the ball in the scrum. The referee is well behind Smith with a view of the tunnel of the scrum. Baptiste -Serin, the French scrumhalf is also on that side of the scrum but further infield than Smith. The referee is further infield again than Serin. New Zealand heel the ball and it comes out of the left side of the scrum, and Smith picks it up and starts to move with the ball as the referee backs away from the scrum. Serin also moves away and is next to the referee. Smith gives to his flyhalf Damian McKenzie who runs towards the referee as Serin bumps into the referee to get to McKenzie. McKenzie veers away, scores and New Zealand go into a 21-14 lead. The referee refers to the TMO and then decides that the try should be awarded. This causes great consternation in the commentator's box, and the comments man states: "I think there has been an injustice here. He [referee] is in the way. Serin can't go anywhere. How can he [referee] not go back and reset the scrum? Come on, officials. We've got to get these things right big time." Referees do not make laws. They are presented with the laws and told to apply them. So let's look at the law. 10. If the ball or the ball-carrier touches the referee or other non-player and neither team gains an advantage, play continues. If either team gains an advantage in the field of play, a scrum is awarded to the team that last played the ball. a. If the ball is in possession of an attacking player, the referee awards a try where the contact took place. b. If the ball is in possession of a defending player, the referee awards a touchdown where the contact took place. 12. If the ball is touched by the referee or other non-player in in-goal, the referee judges what would have happened next and awards a try or a touch down at the place where the contact took place. That's it. There is nothing about the referee's being in the way of a player who is not a ball-carrier. Nothing at all. There is, in other words, nothing in the law for the referee, in this case, to do anything for being in Serin's way. The referee must take up a position on the field. The position this referee took up at the scrum is a normal, acceptable one. He can see the put-in, see the ball's progress and see the scrumhalf's pick-up. Serin knows where the referee is. There are other routes for him to take instead of straight at the referee. In similar circumstances in the match between Ireland and Australia, Conor Murray, Ireland's scrumhalf, runs behind the referee to defend. Serin could have done that. 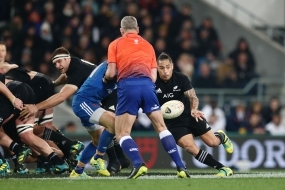 A referee in the way in a case like this has no law to help the "obstructed" player, any more than there is a way for a referee to act against the perverse bounce of a rugby ball. What the official, John Lacey, did was right this time. It's hard to see the law changing, for the referee could become a target, a much easier person to run into that some big, strong opponent.